The Revelation is the Amarr Dreadnought-class capital ship and is designed for dealing damage to structures, larger subcaps and other capitals. The Revelation used to be considered a inferior dreadnought compared to the Gallente Moros and Minmatar Naglfar. This is no longer the case as of the Citadel release (May 2016), as it now has a much larger base capacitor, the guns drain less than Moros at max level and the new 4% bonus armor resistance is very useful. Its main benefit over the other dreadnaughts now comes from consuming no ammunition (if using T1 lasers), being able to instantly switch ranges and having the largest range with "short range" guns (Scorch XL can hit out to 80km). Fitted with high tracking guns and a tracking module or two this ship can track Battlecruisers and Battleships with ease, dealing between 1500 and 3200 dps to its targets. It can still hit Cruisers for a fraction of that. 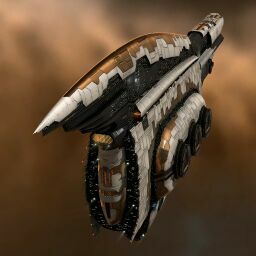 The addition of a Fleet Hangar and a Ship Maintenence hangar has made Dreadnought-class capital ships very well suited for use as a suitcase capital. A perfect traveling "suitcase" for nomadic groups. A slightly adapted version of the past WAFFLES. doctrine Revelation. Loaded Explosive charge in the Flex Hardener is standard, but carry the other types too. Carry all the scripts, Conflagration XL, Multifrequency XL, Standard XL, and Radio XL, ideally Tier 1 pirate grade (Blood or Sanshas, but not Dark Blood or True Sanshas). Use Meta 0 guns for dread bombs and dread feeds, and Meta 0 Plates, possibly even run cheaper Nano Platings, along with a Meta 0 capital energy neutralizer. 7866 DPS out to 105km using Scorch XLwith both Optimal Range Scripts loaded. 11012 DPS with Conflagration XL, 9439 DPS with Sanshas Multifrequency XL. 2.15M EHP base, with Explosive Script loaded. Tech II Guns are a Big Deal on this hull. High Angle Dreadnoughts for small drops have found recent favor because people have learned how to deal with carriers better. This one is a basic drop dreadnought for such cases. You can adapt it for "Solo Dreadnought" runs by running Enduring armor repairers and possibly changing the tracking computer to faction stasis webifier. Your preference. Triple Metastasis Adjusters is another option. Carry all the usual types of ammo: Conflagration XL (probably don't need it); Multifrequency XL, Standard XL and Scorch XL. Bring plenty of strontium, enough fuel, and plenty of cap boosters, and Drop. Used for when the Avengers are on field. Switch for high angles as needed. You may need a 8% drifter drug to remain alive in capacitor, everything else is fine. Or, cheap implants. Bring refits. May be over tanked. Works best when paired with a HAW Naglfar to shoot at the subcapital rats. Some people like to use Semiconductor rigs -- these actually provide less regen than CCC rigs do. Bring all the refits you need. You may also be fit with 2 capital guns and 1 HAW, put the HAW on the subcaps and the capital guns shoot the Avengers. If you use multiple dreads then one should be HAW and the other should be capital gun fit. No sub-article about Revelation roles or piloting tactics. You can write them here. You can write additional notes for Revelation here. This page was last modified on 16 April 2018, at 13:13. This page has been accessed 114,478 times.